Uses leftover slow cooked brisket to make the sloppy joes. 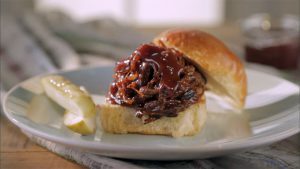 See my Beef Brisket recipe here. 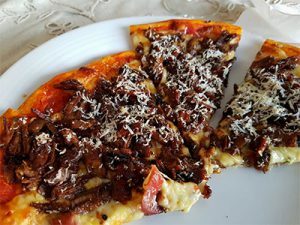 You can use this same recipe to add some extra toppings on your pizza! Add bell pepper and jalapeno (if using) and cook, stirring occasionally, until softened, 3 to 4 minutes. Add tomatoes, chili powder and salt and cook, stirring, for 1 minute. Add brisket, gravy, molasses and brown sugar; stir well. Cover and simmer for 10 minutes to meld flavors.